A robust scrummager, Ross made his name during a three-year spell in England with Harlequins. A former Cork Constitution and Munster representative, he joined Quins in 2006 and made 62 domestic appearances for the London club before signing a deal with Leinster in hope of boosting his international chances. 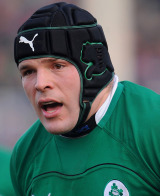 He won caps for Ireland at 'A' level before making his Test debut against Canada in Vancouver in June 2009. He later made his Six Nations bow in 2011 clash against Italy and following a successful Championship re-signed with Leinster and the Irish Rugby Football Union. Ross quickly became the cornerstone of Ireland's scrum and was credited for much of the improvements they made. He featured in all five of Ireland's World Cup games, starting four of them, as the Irish bowed out at the quarter-final stage. He continued as Ireland's No.1 No.3 for the Six Nations but the tournament ended on a sour note for Ross as he was forced off in the final match against England with an injury, and had to watch his team suffered a thrashing at Twickenham. Further humiliation would follow for Ireland on their tour to New Zealand and, after a successful set of autumn internationals, their Six Nations campaign hit the skids after a promising start. However Ross remained one of the front runners for a place on the Lions tour to Australia.